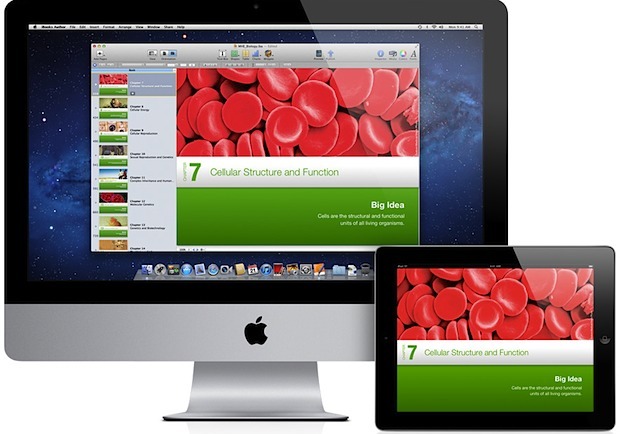 Apple has released iBooks Author, an easy to use app for Mac OS X that lets anyone create interactive multi-touch books for the iPad, these can be published on the iBookstore or iTunes U and offered as free or paid titles. iBooks Author should be a big hit with both small and large publishers, teachers, and anyone else who wants to become a published eBook author. While the original aim is the educational market, made obvious by all six templates being textbooks, iBooks Author really has much wider appeal and could very well start an independent iPad book publishing craze on the iBookstore just like the App Store did years ago for apps. I’ve been playing around with the app all morning and it really is nice, with surprisingly powerful tools put into a simple to use interface. One unfortunate obstacle for publishing that is beyond Apple’s control: ISBN numbers. ISBN’s are a series of numbers sold by a monopolistic organization who charges a highly inflated $125 for a single number, or sells them in packages at $1000. These numbers required to sell a book through the iBookstore (or anywhere else for that matter). Other than that, there are no fees attached, but Apple does take their customary 30% of each book sale to provide the iBooks service and store. If you’re interested in the iBooks publishing program, don’t miss the iBooks Author Gallery and check out Apple’s FAQ on the matter. The ISBN requirement should keep a lot of rubbish out of the book store. Would books made with iBook Author be readable on iPhone or iPod Touch through iBook as well as iPad’s iBook? Played around with iBooks Author today, but I would suggest you wait before betting the store on it. This was clearly rushed to market. Cut-n-paste gives unpredictable results, text boxes don’t display their contents, styles jump around at random … wait it out for a few point upgrades. There seems to be some buzz on twitter regarding this program and Apple’s over intrusive (unfair?) EULA. As I understand it (and I could be wrong), Apple is claiming rights to any material created via it’s ibook authoring software, in addition to putting a limit that the created ibook must only be on sale via apple’s ibook website. An analogy was made that if you used Microsoft word to write a book, then Microsoft would own partial rights to the book. Apple also apparently has the right to refuse an ibook for sale too. The EULA does not give Apple any rights to a work created in iBook Author. What it does though is limit what the author can do with the work. Unless the author gives away the work for free, the EULA limits its sale to Apple’s sales channel. This would, in fact, be similar to Microsoft limiting what you can do with a document written in Word. Additionally, while the EULA limits the ability to sell the work anywhere other than Apple’s sales channel, it also gives Apple the right to refuse to sell it for any reason or for no reason at all. Absent some change in the EULA, I’ll stick to other apps to do my creative work. It’s not accurate to say that ISBNs are required to sell e-books “anywhere else for that matter.” Apple and Sony are the only 2 holdouts that require use of an ISBN — the major e-bookstores, including Amazon and B&N, do not require an ISBN. Not really Apple’s fault, although there’s no good reason these days for them to require an ISBN (Amazon seems to do OK without requiring them, they just assign their own internal ID number).